Don’t you love a change in season (yes, even if you do live in sunny Queensland)!! 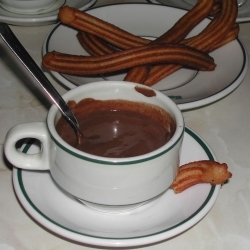 Hot chocolate that you have to eat with a spoon? Wooly socks. Investing in a furry animal such as a cat or dog to warm your feet? Tim Tam have gone even further in Sydney today with the launch of their ‘Truly, Madly Tim Tam’ campaign designed by DDB Sydney to celebrate the love that we Aussies have with Tim Tams. 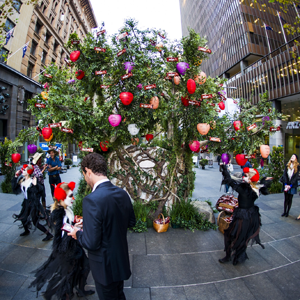 Gone is the genie that granted our wishes a few years back, today the orchard launch in Sydney of this integrated campaign sees more than 30,000 Tim Tam bickies able to be picked and nommed (today only). So if you are in Sydney, hurry on down and please enjoy one for me!I wonder if they still make the chilli flavour? Arnott’s say that they are going to launch more ‘love’ on the rest of Australia, so look out chocolate lovers, as winter equals chocoalte which equals love. Enjoy.